This bloodtrail is 100% real. 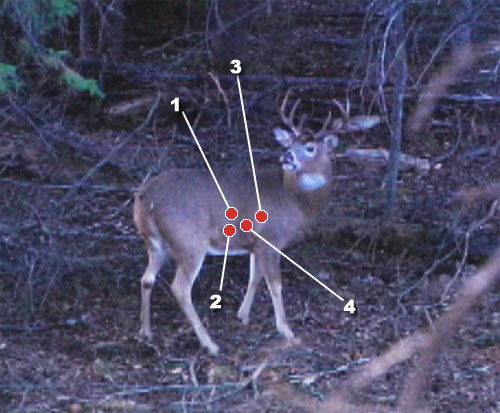 All the pictures and steps are as it happened during Pat Lefemine's deer hunt in Saskatchewan, 2009. Good Luck! This bloodtrail brought to you from our November LIVE HUNT While bowhunting with Rob Nye of Canadian Trophy Quest in Saskatchewan, this big-bodied buck came in after some does and I decided to take him. Distance is 25 yards and I have a clear shot. Please answer the first question. 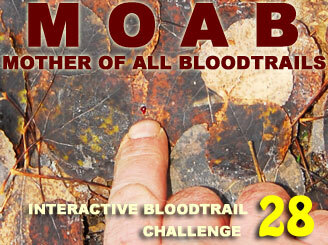 MOAB Edition - This is the most difficult bloodtrail I have ever filmed and recorded. Hence the term "Mother of All Bloodtrails." This challenge is a mixed bag. A little bit textbook, a couple of tricks and a test of your experience and powers of observation. Play at your own Risk. Have Fun, and above all NO WHINING!